Happiness is a choice, and today I choose it for myself. 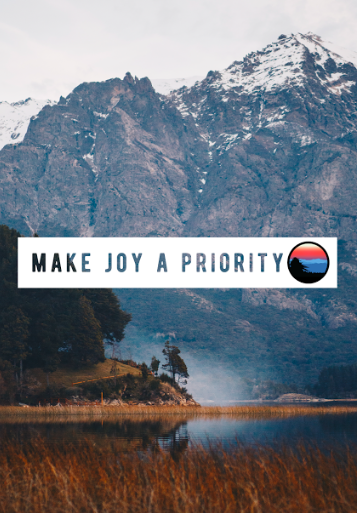 Last week, while talking to a friend of mine, our conversation shifted to outlooks in life and I mentioned that while I have had a lot of less than note-worthy moments in life, I have always had the mindset that happiness is a daily choice we make. That within each day, each situation, we can choose to be happy, even it’s that we are happy to be learning from a mistake or tough situation. Or we can allow the inevitability of imperfection in life dictate how we think and feel about ourselves in a negative way. So how do we choose happiness? How do we find the small positive aspect(s) in even the dimmest of moments? We live in a world where, whether we like to admit it or not, we spend far too much time “plugged-in”. I mean, we can’t even go to the bathroom without our cell phones without feeling odd and out of place. But the secret to being in the present is to be fully attentive to the present. It can be hard to find the good in the day, the things to be grateful for, the things to cultivate happinessin our lives, when we aren’t actually living our lives but are instead living with our phones glued to our hands, constantly seeing what the rest of the world is doing. 2. Stop. Take a deep breath. Slow down. We are constantly going. We work, we commute, we go to school, we drive our children to school and soccer and dance classes. We have 48.5 hours worth of things to do in a 24-hour day and that can get overwhelming quickly. This is one of the aspects of choosing happiness I am really focusing on this year, not letting a sense of being overwhelmed overcast the good in the day. Sometimes we need to just take a pause in our day, literally. Stop whatever you are doing, take a deep breath, and slow down long enough to enjoy whatever it is that you’re doing. Often times what we perceive as our inability to feel happy is actually just the chaos of life overwhelming us to the point that nothing else seems important. Let go of the things that don’t positively serve you in this life. Whether it’s a situation, place, or person, let go of the toxicity in your life in order to have room for the things that make you happy. It really is as easy as it sounds. Holding onto the negative for too long is what makes letting go seem hard. 4. Be ok with imperfection. I am human. You are human. And being human comes with imperfections in who we are, the things that we do, and the way that we live. No matter how much we strive for perfection, being a perfect human and living a perfect life is an unachievable fantasy. It’s ok to not be ok. It’s ok to make mistakes, to fail. Find happiness in your strength to try again, in your resilience, in your constantly evolution into a greater version of yourself. Today, we challenge you to start your week off right by choosing happiness. You deserve it, Blue Ridge Nation.